Equipment is in two locations, the control point and the remote site. The remote site houses an Elecraft K3, ACOM 2000A and a computer for remote desktop operation. Audio, CW keying and PTT are sent via RemoteRig hardware (www.remoterig.com). The K3 is controlled over the internet using RCForb software provided by Elecraft's remotehams.com. A Green Heron rotator controller is remote controlled by PstRotatorAz software and switching functions are provided by N8LP's LP-Remote. An LP-100 precision power meter rounds out the remote rack. The remote site is connected to the internet by Comcast Xfinity, although, due to the long distance to the Xfinity router location (about a quarter mile), a Ubiquity 5 GHz RF link is used. At the control site, the RCForb software displays the K3 virtual controls on a computer screen and a K3/0 Mini control head give me the actual front-panel physical control of the K3 right in the shack. TeamViewer software allows remote desktop control of the remote computer. A SteppIR DB42 is the main antenna. This is a very sophisticated device that tunes from 80 through 6 meters and is controlled by the K3 and the PstRotatorAZ software. 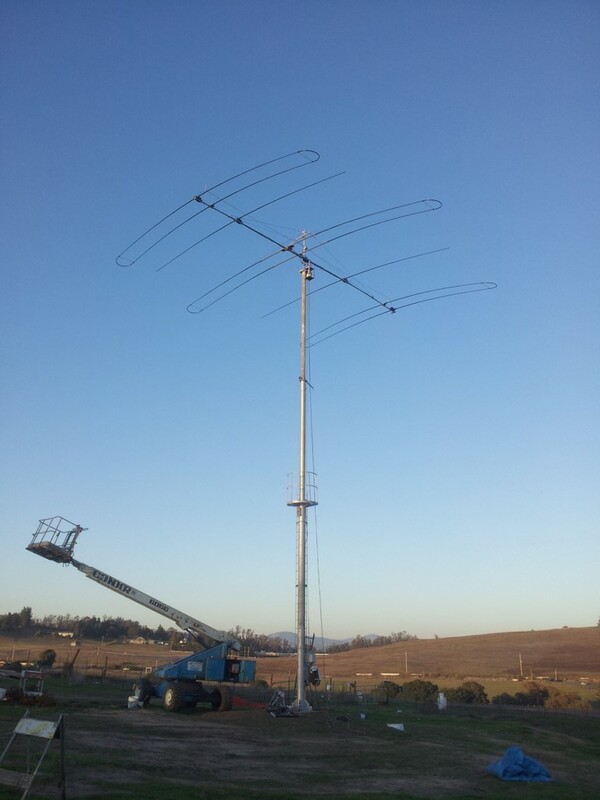 On 75/80 and 60 meters, the antenna uses a capacitive end-loaded, shortened dipole 42 feet in lenght. Located on the 42 foot boom are three 30/40 meter elements, two additional 20 to 6 meter elements and three extra 6-meter parasitic elements. The DB42 is mounted on a 70' heavy-duty telescoping tubular tower by Tashjian Towers. The entire tower and antenna are shunt-fed for operation on 160 meters. An M-Squared Orion 2800 rotator which is side-mounted to the top of the tower using a bicycle-chain drive to rotate the mast.